ARE YOU TIRED OF TODAY'S UNHEALTHY FAST FOOD CULTURE? WELL, SO ARE WE AND WE'RE DOING SOMETHING ABOUT IT. FRESH - Healthy Café is a rapidly expanding international brand, and the global leader in the rapidly growing quick-serve healthy food industry. At FRESH, we are constantly scouring the globe to source the healthiest ingredients for our menu. 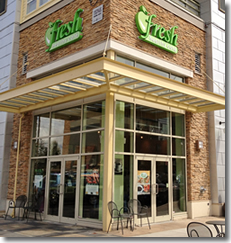 Other restaurants may have a flashy name, but FRESH is all about quality and health. Our customers look and feel great and the atmosphere in our restaurants is electric. Our commitment to living well extends beyond the four walls of our stores. We're committed to the health of the local communities in which we live, as well as the health of our world. That's why we place a major priority on getting involved in the community through school programs, our Healthy Kids Club, sports teams and more. It's also why we serve all our food and drinks in 100% biodegradable cups and other packaging materials made entirely out of corn. We're very proud of this, and our customers tell us they love this aspect of our business. Today's customer has an insatiable, growing appetite for nutritious, delicious food and drinks, unlike the unhealthy fare offered by other quick-service food franchises. We are perfectly positioned to meet this demand, providing our guests with an extraordinary health experience unlike any they've ever tasted. Whether you're looking for a refreshing mid-afternoon smoothie or a hearty meal, every item on our menu is as good for the body as it is for the taste buds. 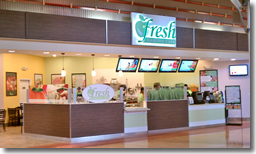 At FRESH, our mission is to provide our guests with a fresh and healthy alternative to typically unhealthy fast food, while providing our owners and operators with a profitable business model and a brand they can be proud to be a part of. Our cutting-edge outlets are located in strategic sites with high foot traffic, clear visibility and easy access, and exude a fun, upbeat ambience that attracts loyal customers. 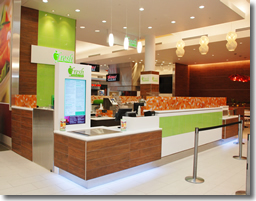 FRESH – Healthy Cafe offers a fresh and healthy food menu combined with the world's best smoothies for an award-winning concept without peer in the industry. All our menu items are made fresh before your eyes, using only natural ingredients of the highest quality. Pure and premium is the best way to describe our food and drinks. Smoothies: 100% pure fruit smoothies with no sugar or artificial sweeteners - the healthiest and tastiest on the market, bar none! Freshly Squeezed Juices: A nutritional power punch squeezed from fresh fruits and vegetables and chilled to perfection. Wraps: Made fresh to order and grilled upon request. Paninis: Mouth watering sandwiches, grilled to perfection. Signature Salads: Light and nutritious, as a meal or side item. Hearty Soups: A daily selection of healthy soups, low in fat and sodium. Lite Blendz: A delightful mix of 100% pure fruit juice with your favorite fruit makes for a guilt-free treat. Wheatgrass: A shot of pure health, infused with nutrients. Fresh Iced Teas: Organic black tea shaken with 100% pure fruit juice - totally refreshing! Organic Coffees & Teas: A variety of healthy espresso bar drinks, both hot and iced. Our full coffee program is available at select locations only. Specialty Extras: Healthy and unique grab-and-go products for active people on the run. At FRESH, we are passionate about our popular products, and confident that our proven operating systems are the best in the business. Unit Franchises: The franchisee pays a one-time franchise fee and opens a single outlet, with options on additional locations within the market and region. Master Franchises: Area Development: FRESH partners with a local Master Franchiser in each country or region to develop the brand in that market, working with and supporting the Master Franchiser in establishing their own stores and recruiting franchise investors. Master Franchises are available in the U.S. and international markets, providing the developer with exclusive rights in a region. Franchisees can enjoy a juicy return on investment because the smoothie and healthy fast casual food industry is extremely viable, relatively simple, requires low investment, and offers very affordable products. Many markets are seriously underserved by this industry. The time is ripe for you to look closely at the incredible business opportunity presented to you here. The experienced FRESH Restaurants team supports you with proven marketing strategies and tools, lease negotiations, store design and set-up, inventory management, business and technical assistance, supplier relationships and, of course, our fresh and healthy recipes. Your success as a franchisee is our goal. Our expert global support team is dedicated to ensuring your business is personally and financially rewarding. After all, we're partners on the same great team: FRESH! "I have been involved with FRESH for 3 years now. I have 3 restaurants in my region and 2 more coming up this year. It turned to be a very profitable opportunity for my family, while "spreading health around"!! FRESH certainly a pioneer in this industry, our menu the most balanced and healthy that I've seen and people are very appreciative of it. FRESH stays on top of all new and healthy trends and growing rapidly across the world." - Al Krasel, Master Franchisee North East Ohio. Click on Request Information button above for FREE information on how to start a FRESH Healthy Cafe franchise today! Please Note: FRESH Healthy Cafe opportunities for sale, and other franchise opportunities, business opportunities, businesses and franchises for sale on this web site are not to be considered as an "offering", "franchise offering", suggestion or recommendation by GlobalBX. The franchises, businesses and business brokers seen on this web site submit their own individual content. This advertisement depends entirely on the truthfulness of the information provided by our advertisers which includes, but is not limited to, franchisers, franchises, franchise brokers, franchise consultants, business sellers and business brokers. As always, GlobalBX recommends that you consult a lawyer, financial consultant, accountant or professional advisor before buying a franchise or business opportunity or any type of business. By submitting this form and requesting more information, you have agreed to all terms and policies of GlobalBX and the business and franchise offerings listed here. Please review our Terms & Conditions for more information.